Chief District Officer (CDO) Kamalraj Dhakal, today contributed NRS 5000/- personally for the rehabilitation of disabled people. He mentioned that, he was very impressed with the activities conducted by HOPE TEAM. He also gave NRS 3000/- before for the treatment of one poor lady suffering from Tuberculosis . Hope Disability Centre is the place where all the local people should donate the fund and which will help in the sustainability of such a good Centre. 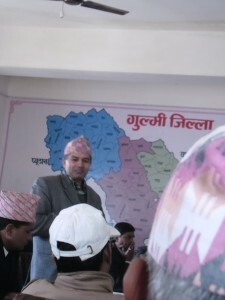 We all Hope Team would like to thank CDO Kamalraj Dhakal for his precious contribution.